The fourth Australian Catholic Youth Festival will invite delegates to follow Mary’s example of saying “Yes” when it opens on the great Marian Feast of the Immaculate Conception. Source: ACBC Media Blog. With about 1000 pilgrims having recently returned from World Youth Day in Panama, the focus has now turned to ACYF, which will be hosted in Perth from December 8 to 10. A new website and promotional video for ACYF officially "dropped" this week. The new site – at www.acyf.org.au – is the premier location for all potential attendees to find out the latest information for the youth festival. 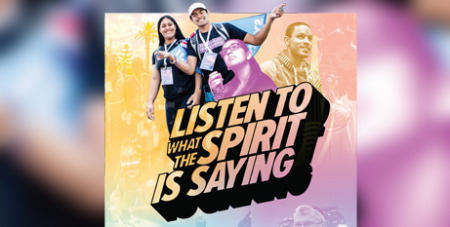 As the largest Catholic gathering in Australia, the ACYF aims to promote and engage the life and voice of young Catholics, providing them with solid formation to live as followers of Christ. Perth Archbishop Timothy Costelloe SDB said the festival will be a wonderful time for the Archdiocese of Perth, particularly as begins on the Feast of the Immaculate Conception, the patroness of the Cathedral and of the Archdiocese. “I invite all young people to have the courage to say ‘Yes’ to this invitation to come to ACYF in 2019, just like the Virgin Mary did when she said ‘Yes’ to be the mother of Jesus,” Archbishop Costelloe said. Archbishop Costelloe spoke about the numerous opportunities festival attendees may take advantage of which in Western Australia, including visiting historic New Norcia – the only monastic town in Australia. “Youth will also have a great opportunity to experience firsthand the life of the Church in Perth in action by attending Mass in our parishes,” he said. ACYF19 will be held at the Perth Convention and Exhibition Centre, with all of the festival's plenaries, workshops, expo and experiences to be held at the venue.